One day, my family went out for dinner and we went to Date no Gyutan. We ordered the usual gyu tan set and my husband the gyu-tan stew. I tasted his stew and fell really in love with the taste and the texture. I googled for the recipe with the key word “beef stew” and none of them came close to good or tasty. There was even one time that I threw the whole soup, washed the beef then turned in into sukiyaki or semur. It took more than half a year until I saw on TV a chef making demi glace sauce and it looked pretty easy. This was part of learning French culinary art series but made easy for home cooking. OMG..at last I found it. Japanese loves Demi Glace. It is everywhere from hamburger steak sauce, to beef stew to spaghetti. What you can do is make it then store it frozen because it yields a lot. 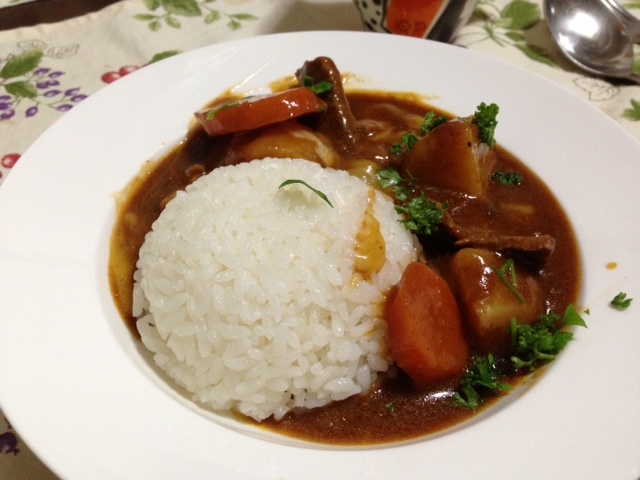 Oh Mama Miyuki, that stew looks wonderful! I want that for dinner tonight! So how would I use the demi glace… would I just simmer my meat and vegetables in it? Thank you! well, you have to do the demiglace first, meat, tomato juice, assorted herbs, carrot, celery, etc. then add salt and brown sugar..when all is done, filter scoop the soaked veggies, leave the meat in and add fresh new carrots etc..
Hi Mama Miyuki! I love demi glace sauce and did not know that it used brown sugar. I shall give this one a try. Yum!